Edward Theodore Chalmers Werner (1864–1954) was a noted British diplomat in Qing Dynasty China and sinologist specialising in superstition, myths and magic in China. E.T.C. Werner was born at Port Chalmers, Dunedin, New Zealand. His father was Prussian and his mother English. He was educated at Tonbridge School. His father died in 1878 and E.T.C. had to find a career. He passed the entrance exams to the Far Eastern Cadetship. Werner arrived in Peking in the 1880s attached to the British Legation as a student interpreter. Werner remained in the British consular service in China until 1914 serving in postings including time working in the Chancery at the Peking Legation, then a year in Canton (Guangzhou), two in Tientsin (Tianjin) and another couple in Macao. He later spent a year in Hangchow (Hangzhou), one in the Pagoda Anchorage (Mawei), the isolated Kiungchow (Qiongshan) on Hainan Island, a couple of years on the Gulf of Tonkin in the remote posting of Pakhoi (Beihai) before being posted to Kongmoon (Jiangmen). Promotion saw Werner Consul at the busy tea port of Kiukiang (Jiujiang), serving for four years. In 1911 Werner became British Consul-General in Foochow (Fuzhou). He left the consular service in 1914. After retirement Werner moved back to Peking where he concentrated on his sinological studies. He was a member of the planning committee of the Peking Union Medical College, a lecturer at Peking University, member of the Chinese government’s Historiography Bureau and a member of the Royal Asiatic Society. E.T.C. Werner was married to Gladys Nina Ravenshaw (1886–1922) in 1911 in Hong Kong. Gladys was the daughter of Lieutenant-Colonel Charles Withers Ravenshaw, the former British Resident in Nepal. In 1919 the couple adopted a baby daughter, Pamela, in Peking. Between 1943 and 1945 E.T.C. Werner was interned by the Japanese at the Weihsien Civilian Assembly Camp, The Weihsien Compound, in Shandong. 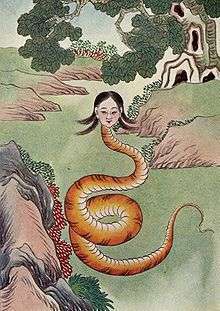 An illustration from "Myths and Legends of China, 1922"
↑ Paul French. Midnight in Peking: How the Murder of a Young Englishwoman Haunted the Last Days of Old China. (Beijing: Viking, 2011; London: Viking, 2012; New York: Penguin Books, Rev., 2012). ISBN 9780143121008. ↑ Jonathan Spence,Who Killed Pamela in Peking? New York Review of Books March 21, 2013. Obituary, Mr E.T.C. Werner, The Times, February 16, 1954. p8.